Kids Can Sign…..Kids Can Sign…..Kids Can Sign!!!! It’s like a chant because it is true! I love to see little ones signing! It is astonishing at an early age when they have not formed communication (speech skills) but they can gesture (sign) word to express how they feel. I am a child of deaf adults and I learned to sign at an early age. I remember signing more than I talked. As a matter of fact, I learned speech from my close family members, t.v. and the radio. I always tease thank goodness the radio and t.v. shows were a lot better at that time, who only knows what I may have learned if I listened to what was on t.v. today. Anything I needed I had to sign to communicate with my parents and siblings. I did not appreciate it as much as I do now. When I gave birth to my first child her grandmother taught her the signs she knows and still remembers at eighteen years old. I am thankful to my mom for giving us a gift that has benefited us in so many ways and moreover a gift that no one can take away. When my mom passed, she stopped signing as it was difficult for her to do without thinking about her grandmother. However, when you put her in a signing environment the signs flow from her hands as if it were yesterday. This proved to me firsthand that once you teach children they retain it especially if your routinely use sign language in their daily lives. In general it has been said that children who learn sign langauge early on have less issues when comes to frustration, temper tantrums and aggressive behaviors. It also helps increases interaction between parents, educators and children. Children also build self-esteem by making them feel capable and proud they are able to communicate. If we can start our children off on the right foot why not? One of the best gifts to give our children and help them start off on the right foot with academics and training for future employment is the gift of being bilingual. There are several commonly used languages in our great country English of course next is Spanish and after that is American Sign Language as other languages rise and become more common, our children need to be bilingual in one of these languages, any popular language. I cannot think of a time where being bilingual has not been a benefit to me or my oldest daughter. 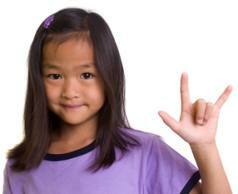 Teach your children ASL from birth and start them on the path to bilingual success. There are resources below to continue your reading about the benefits of sign language and children.